Rice is a time-honored staple in most American kitchens, and no wonder: It’s filling, versatile and ridiculously, gloriously cheap. Like, seriously cheap. I’m talking 2.5 cents per ounce when you buy the 20-pound bag from Walmart, and even lower if you buy in bulk. Not bad at all, but there is one important caveat. Rice is only that cheap when you’re buying cheap rice. And as you may have noticed while perusing the rice aisle, not all of it is so affordable. Depending on the amount, brand and variety, you might pay as much as 40 cents per ounce, or more! That’s more than 15 times the cost outlined above. Of course, these fancy rices supposedly offer superior nutrition, fail-proof cooking, a gourmet cultural experience and, of course, prettier packaging. So, is it worth the cost to upgrade? What’s a rice-hungry Penny Hoarder to do? You’d think at least something in life could be simple, just for once. But even with this everyday food, it’s not the case. To figure out if costlier rice is a worthwhile investment, we must first figure out what supposedly makes it so much better in the first place. So here’s a breakdown of a few of the most common varieties of rice (although even this is by no means an exhaustive list!) and what benefits they might add to your culinary arsenal. Author’s note: For the purposes of this post, I’ll ignore branding, which can add a mighty price increase in its own right. I can’t say this for sure, but… it’s rice, right? I doubt the name on the package has much to do with the product’s taste and nutrition, although processing and sourcing might be different in significant ways. This is what you probably think of when you think of rice: the good ol’, regular white stuff. It comes in long-, medium- and short-grain varieties, and the U.S. government requires companies to enrich it with B vitamins and iron. That’s because white rice is actually brown rice that’s been stripped of its tough, but nutrient- and fiber-rich exterior germ and bran. Without the enrichment treatment, it’s kind of nutritionally void — and a diet based primarily on it might actually make you sick. Anyway. White rice is super-popular and super-cheap, and its neutral flavor makes it a good accompaniment for many dishes. It also boasts a longer shelf life than whole-grain rices and takes less time to cook. Taste: Mild, with a light, fluffy texture, depending on grain length and whether it’s cooked correctly. White rice is probably the most versatile type. Nutrition: Although white rice actually has slightly fewer calories per cup than brown rice (199 versus 216), it also has less protein and fiber, and far less magnesium and vitamin B. Brown rice is just white rice with all its clothes on. It’s also arguably better for you, since it has more naturally occurring nutrients, fiber and protein. Brown rice also comes in different grain sizes. Taste: A little nuttier and chewier than white rice; hearty and satisfying, but it’s definitely got a distinct flavor. Nutrition: Brown rice doesn’t need any stinking enrichment! It’s got lots of vitamins and minerals, and even a trace amount of unsaturated fat — which is good for you! Cook time: Because brown rice still has its germ and bran, it takes a bit longer than white rice to soften — closer to 45 minutes. Jasmine rice is a long-grain variety of fragrant rice from Southeast Asia, primarily Thailand. Taste: Because jasmine rice is “fragrant,” it does differ subtly in flavor from regular white rice, but the most important difference here is texture. After you prepare it, jasmine rice is soft and slightly sticky, which makes it great for stir-fry, as a side dish or in soups, but not so great for frying. Nutrition: Just like regular brown and white rices, jasmine rice offers more or less nutritional value based on how much it’s been processed. Cook time: Again, you can cook white varieties in about 20-30 minutes, whereas brown might take double that time. Another long-grain, fragrant rice, basmati rice hails from India and Pakistan. However, because it’s so much pricier than other varieties — and because it can be hard to tell the difference between it and, say, jasmine — crossbred or otherwise inauthentic rice is sold fraudulently as basmati with shocking frequency. What does that mean to you? Be on guard for a rip-off! You might spend extra cash without getting the extra flavor kick and light texture basmati’s known for. Taste: A slightly earthier, spicier flavor than other regular rice varieties. Nutrition: Similar to jasmine rice — no special qualities. How to cook it: Again, similar to jasmine. This one’s kind of a ringer. That’s because wild rice isn’t actually rice at all, but a grass! As such, it’s got more protein, and slightly fewer carbohydrates and calories per cup. It also tastes super-different from any other rice we’ve looked at thus far. Taste: Chewier and denser than even regular brown rice with a notable nutty, toasty flavor. This one definitely brings something distinct to the table. It’s great for pilafs! Nutrition: As mentioned above, wild “rice” has about 166 calories per cup, as opposed to about 200 for most other varieties, and since it’s a whole-grain rice, it’s full of micronutrients. How to cook it: Wild rice is a little different from other types, as you might imagine, and its cook times can vary from 30 minutes to over an hour. 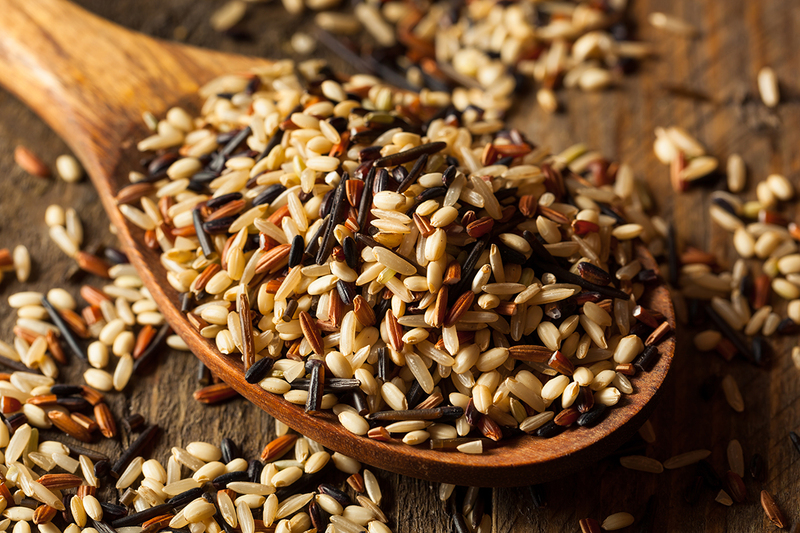 Unlike other varieties, wild rice can benefit from soaking before you cook it since it’s such a tough whole grain. Alright, So… Is It Worth it to Upgrade? It depends on you: your personal preference, how you value the balance of nutritional benefits versus taste and how observant you are as an eater. My father, for example, probably wouldn’t know the difference between fresh basmati rice straight from the foothills of the Himalayas and the stuff that costs cents on the dollar. Another factor to consider: What kind of dish is the rice for? If you’re going to put it in a soup, for example, the finer texture and subtle taste difference of jasmine versus regular rice probably won’t matter, and thus isn’t worth the upcharge. But if the rice is a major component of the meal, that’s a different story. In case your head isn’t already spinning, keep in mind that different kinds of rice are naturally better-suited for different applications: Short rice tends to cook up clumpier and stickier, so it’s used to roll sushi; medium-grain rice is classic in risotto; long-grain rice is light and fluffy and a perfect bed for your stir-fry. So unfortunately, you’ll have to decide for yourself. But my advice? If you’re happy with the taste, choose the brown version of your favorite rice. It usually costs about the same, and you’ll still reap the nutritional benefits, if nothing else. Your Turn: What’s your go-to rice variety?